Galaxy clusters are some of the most massive structures found in the universe — and apparently they sound pretty spooky, too. NASA's Hubble Space Telescope captured a stunning new view of the spiral arms and elliptical structures of thousands of galaxies all nestled together. Researchers from the science-art outreach program System Sounds then converted this Hubble data into eerie recordings, demonstrating the various musical tones that galaxies sing, according to a statement from NASA. "Compact galaxies and a few foreground stars create brief tones, while elongated spiral galaxies produce longer notes that can change pitch," according to System Sounds. The galaxy cluster in question, known as RXC J0142.9+4438, contains thousands of galaxies held together by gravity. In addition, each galaxy is home to countless stars — some of which shine brightly in the foreground of the Hubble image. The largest grouping of galaxies lies near the center of the image and produces sound in the midfrequency range, which can be heard about halfway through the video. Conversely, objects captured near the bottom of the image produce lower notes, and those near the top produce higher notes, according to the statement. The photo was taken Aug. 13, 2018, using Hubble's Advanced Camera for Surveys and Wide Field Camera 3. 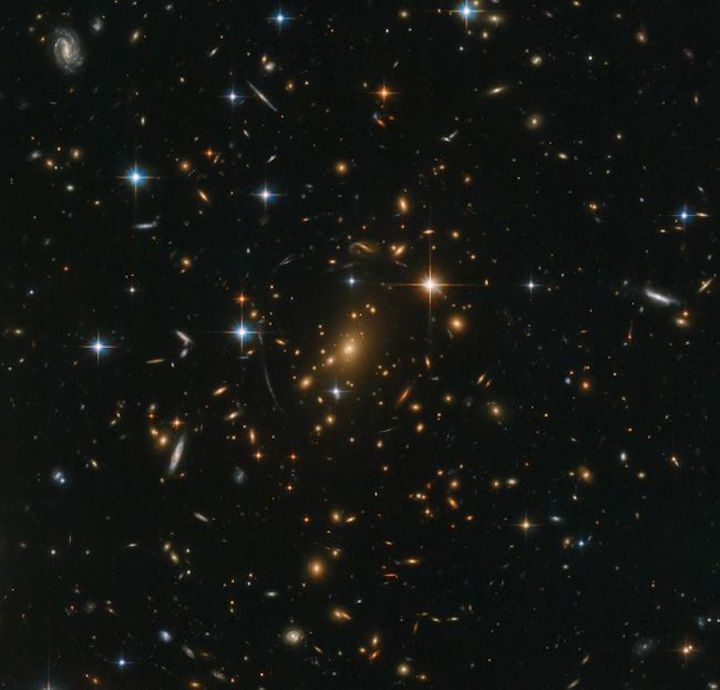 When a massive object, such as a galaxy cluster, falls between an observer (like the Hubble telescope) and a more distant target in the background, the intervening object creates a so-called gravitational lens that magnifies the observer's view. This Hubble image was captured as part of an observing program called RELICS (Reionization Lensing Cluster Survey). Galaxies identified through the program will be studied in greater detail by the James Webb Space Telescope, which is expected to launch in March 2021.